In September 2014, travel trade magazine TTG featured an interesting article titled "Turnaround Tricks". 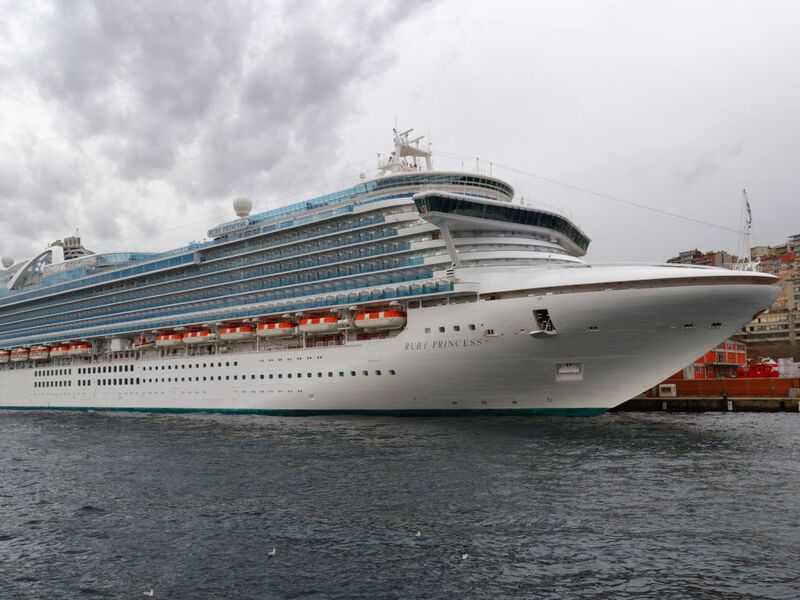 The article described how Katherine Lawrey shadowed Richard Harry, Hotel General Manager on Ruby Princess, during a turnaround day in Southampton. The article was full of the type of mind-boggling statistics that I love. The figures relate to the turnaround of the ship, which is the process of unloading passengers, restocking supplies, and loading a new set of passengers. With just a few hours to complete the turnaround, it is a high pressure, labour-intensive task. Ruby Princess entered into service in November 2008. A 'Grand' class ship (sister to Crown Princess and Emerald Princess), she was constructed by Fincantieri in Trieste, Italy. The 113,000 gross tonne vessel measures 290 metres (951 feet) in length and up to 36 metres (118 feet) in width. It has a total of 19 decks, with 15 publicly accessible. The ship can handle up to 3,575 passengers across 1,542 cabins, and up to 1,225 crew members. On this particular sailing, passengers disembarked at an average rate of 750 per hour, across a variety of disembarkation groups and programs. The first passengers left at 6.15am and the last at 10.15am. Clearing the ship in four hours left 60 precious minutes where no paying passengers were onboard. I was unaware of the additional regulations that affect some sailings to, and around, the United States of America. For instance, if the ship has been away from the US for more than 90 days then the entire ship (including crew) has to go through a mandatory immigration inspection. This exercise can take several hours to complete, eating into the precious turnaround time. The ship needs to conduct a full crew drill and emergency evacuation twice a year. This type of training requires the cooperation of coastguard services and can take an hour to complete. It is essential safety training but eats up yet more precious time. Boarding officially commences at 12 noon, but on this sailing, they managed to start a bit earlier at 11.45am. Passengers typically boarded at a slower rate of 700 per hour, which in itself is still an impressive rate. The 'dance of the suitcases' is a choreographed routine for every cruise ship, and no matter how many times you have sailed before, it never ceases to impress. Ruby Princess has around 8,000 suitcases to unload. The volume is so high that some staff are relieved of their regular cleaning and laundry duties and re-assigned to baggage handling instead. It all starts the night before when crewmembers collect suitcases from the corridors. Luggage is sorted and grouped in storage for speedy offloading in the morning. Once all the bags are off, the system switches into reverse. Forklift trucks load crates of suitcases onto the ship, and the task of distribution to cabins begins. From a passenger perspective, you may not necessarily think about the other 8,000 bags that need sorting. It amazes me how many times I've heard people complaining about missing bags at 2 pm. Crewmembers work as fast as they can, but they cannot deliver 8,000 bags instantly. As soon as passengers have vacated, all cabins need cleaning. Between 8 am and 11.30 am, 86 stateroom stewards clean up to 19 cabins each. Each cabin requires a thorough clean, new linen and towels, vacuum cleaning, and a wipe-down of surfaces. It takes me a couple of hours to clean my bedroom, so it is incredible how the stewards can clean a cabin to Princess standards in 10 minutes. An additional 56 laundry stewards and cleaners are roped in to help clean the bathrooms. One fun fact about Ruby Princess is that there's a laundry chute that leads to Deck 2 on every passenger deck. I imagined laundry was carted downstairs - a laundry chute is a major time saver. A crew of 22 work in the laundry department, an industrial-sized operation. Each of the six washing machines, for instance, can take 136 kilograms (300 pounds) of laundry per load. For what it is worth, mine can take 7kg! There are eight dryers onboard, and each of these can take 45 kilograms (100 pounds) a cycle. A machine handles the ironing, and it automatically folds and presses linen too, at a rate of 200 sheets per hour. In a typical day, the laundry department processes 1,200 bedsheets, 3,000 towels, 500 table cloths, and importantly, 1,000 crew uniforms, plus any customer orders. Food is a big part of the cruising experience, and 130 tonnes of food was loaded onto the ship for a 12-day voyage around the British Isles. The ship received 33,800 kilograms of fruit. The produce needed to be at varying stages of ripeness to cater for varying passenger preferences and to ensure it lasts until the end of the voyage. As passengers start eating the moment they step onboard, it is essential to have ripe fruit ready. The vessel also took delivery of 20,760 kilograms of meat, allowing 1,730 kilograms of meat for daily consumption. On Ruby Princess, passengers typically eat their way through 454 litres (100 gallons) of ice cream and sip their way through 2,136 litres (470 gallons) of coffee each day! The cruise ship is very much like a resort hotel with one massive difference - you cannot just nip into town for supplies. While food and drink are clearly a big priority, there is a mountain of other commodities you may not have even considered. On this sailing, seven tonnes of hotel consumables were loaded (think things like toilet rolls and new crockery). I don't know about you, but I've never considered that could be required must be available on the ship. That includes enough paper to print on, ink to print with, enough toilet paper to go around, enough spare stationery, toiletries, medical supplies, etc. Are you amazed at the size of the operation that goes on in a typical turnaround day? Leave a comment below.